This clip - from a Ric Burns documentary about New York City - provides information about Tammany Hall and its nineteenth-century leader, Boss Tweed. William March Tweed was a big man. Standing more than 6 feet, and weighing nearly 300 pounds, he was formidable to see. Although he helped the City with significant projects, benefitting its residents, Tweed was not a man to cross. Used to getting his way, Tweed frequently bent the law in his own favor. He was accused of stealing from the public coffers (or at least diverting funds to himself and his friends). As major projects to benefit the City were planned - such as Central Park and the Brooklyn Bridge - it helped to know where sewers (for example) would be positioned. Tweed knew, and with that knowledge he bought the specific land which the City would need. It was just one way he used to increase his personal bank accounts. Then there was the court house - a seemingly never-ending project - which cost more than Britain’s Houses of Parliament. By 1870, people were wondering where Tweed was getting all his money (and why it was taking so long to build the courthouse). George Washington Plunkitt of Tammany Hall, New York's Democratic political machine, distinguished between "honest" and "dishonest" graft. Dishonest graft involved payoffs for protecting gambling and prostitution. Honest graft might involve buying up land scheduled for purchase by government. As Plunkitt said, "I seen my opportunities and I took 'em." 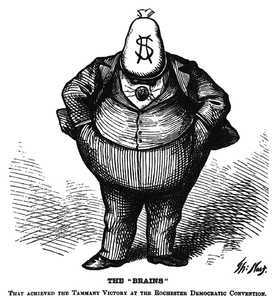 Thomas Nast - the famous political cartoonist - directed his wit and talent against Boss Tweed. As people grew weary of Tweed’s greed and arrogance, Nast’s lampoons were a feature of Harper’s Weekly. By the 20th of September, 1870, Boss Tweed was accused of robbing New York’s treasury. Serving time in prison, he was allowed home visits. On one of those visits, he escaped ... to Spain. After he was recognized (because of Nast's cartoons), he was returned to New York. He died, at Ludlow Street Jail, on the 12th of April, 1878. His remains were buried in Brooklyn's Green-Wood Cemetery. Clip from Ric Burns’ New York: A Documentary Film - a multi-part film lasting more than 17 hours - online, courtesy PBS via YouTube. Copyright Ric Burns, all rights reserved. Clip provided here as fair use for educational purposes. Bos, Carole "William Tweed - Boss of Tammany Hall" AwesomeStories.com. Oct 07, 2013. Apr 23, 2019.